DAY vs. THE DEMS AGAIN: Will the Budget War Ever End? Did you think the arduous county budget battle of 2016-17 was settled, with County Executive Ed Day and six of seven Republican legislators narrowly defeating the Democrats on the strength of Day’s veto? Think again! Both sides had been aware that in early 2017 a contract with the Sheriff’s deputies was due to be settled and would cost the county additional monies. That money was not explicitly reserved in the 2017 budget because Day said telegraphing a dollar amount would have harmed the county’s negotiating position. When Day proposed a funding mechanism to pay for the $2.1 needed for the settlement, which includes three years back pay, Democrats surprised Day and rejected it. Vice Chairman of the Budget and Finance Committee Legislator Michael Grant countered with a proposal that rehashes many of the same arguments from the recent budget battle. 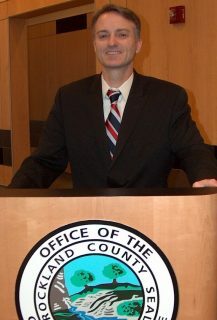 Grant’s funding proposal includes an assumed $1 million in sales tax Day’s administration does not believe exists, cuts Day’s $50,000 allotment for one mass mailing, eliminates several positions including one Day said will put a $3 million federal grant in doubt and cuts the new inspector general position proposed by Day to prevent corruption and waste in county government. Day sees Grant’s moves as pure politics “Washington DC-style,” while Grant argues that his proposal was necessary because Day’s plan was criticized by the NY Comptroller’s Office. He told the Rockland County Times the Democrats’ budget proposed in December had only missed ratification by one vote and he believes this time around he may be able to find that vote. Day scoffed at Grant’s criticism, stating the Comptroller’s questions were answered and his $2.1 million in revenue had been worked on with Finance Commissioner Stephen DeGroat, a financial expert, while Grant was relying on the opinion of O’Connor and Davies audit firm, a company many consider tainted due to its work in the Town of Ramapo. Worse yet, if the two sides can’t work something out by February 3, the county will be in breach of the new contract with the deputies, although it is not clear what the deputies would do about it. In an interview with the Rockland County Times Grant blasted Day for having a “my way or the highway” attitude and failing to communicate with legislators. Meanwhile, Day said he had indeed been in touch with the chairman of the Budget and Finance Committee Jay Hood, Jr. and was hoping to forge a positive relationship with the new Democratic leaders in place this year. Chairman Hood was absent at the meeting in which Grant advanced his alternative funding proposal. Hood told the Rockland County Times he was not fully in the loop regarding Grant’s funding ideas and deferred any questions to Grant, even though Grant has a junior status to Hood this year. In an interesting twist, Grant’s daughter Caitlyn had applied and nearly been hired for a “special coordinator” position that Legislator Grant has now proposed to eliminate.